The respondent Phillip R. Salvador was charged with estafa under Article 315, paragraph 2 (a) of the Revised Penal Code. The Regional Trial Court and the Court of Appeals acquitted him of the same but the civil aspect of the case remained. Respondent Salvador then filed a petition for review on Certiorari to the Supreme Court. Petitioner Cristina B. Castillo is a businesswoman engaged in real estate business, educational institution, boutique, and trading business. She was then enticed by Salvador and his brother, Ramon Salvador to engage in freight and remittance business. As petitioner had deeply fallen in love with respondent Salvador and since she trusted him very much as he even acted as a father to her children when her annulment was ongoing, she agreed to embark on the remittance business. She agreed with respondent and Ramon that any profit derived from the business would be equally divided among them and that respondent would be in charge of promotion and marketing in Hong Kong, while Ramon would take charge of the operations of business in the Philippines and she would be financing the business. The business has not operated yet as petitioner was still raising the amount of US$100,000.00 as capital for the actual operation. When petitioner already had the money, she handed the same to respondent Salvador which was witnessed by her disabled half-brother Enrico B. Tan. However, the proposed business never operated as respondent only stayed in Hong Kong for three days. When she asked respondent about the money and the business, the latter told her that the money was deposited in a bank. However, upon further query, respondent confessed that he used the money to pay for his other obligations. Since then, the US$100,000.00 was not returned at all. Must the award of damaged be retained despite the acquittal of the accused in the criminal case? The award of damages must be removed. 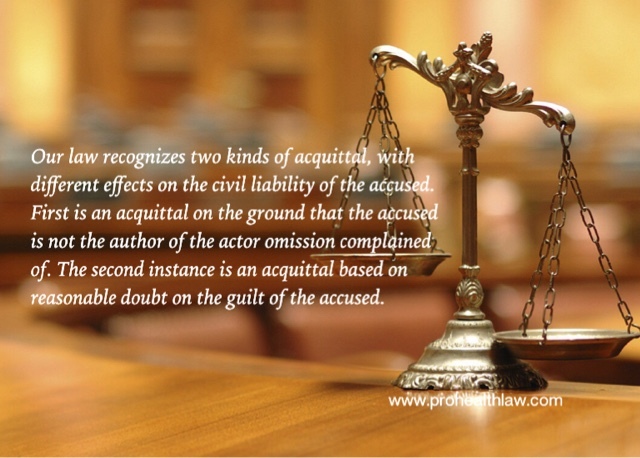 Our law recognizes two kinds of acquittal, with different effects on the civil liability of the accused. First is an acquittal on the ground that the accused is not the author of the actor omission complained of. This instance closes the door to civil liability, for a person who has been found to be not the perpetrator of any act or omission cannot and can never be held liable for such act or omission. There being no delict, civil liability ex delictois out of the question, and the civil action, if any, which may be instituted must be based on grounds other than the delict complained of. This is the situation contemplated in Rule III of the Rules of Court. The second instance is an acquittal based on reasonable doubt on the guilt of the accused. In this case, even if the guilt of the accused has not been satisfactorily established, he is not exempt from civil liability which may be proved by preponderance of evidence only. This is the situation contemplated in Article 29 of the Civil Code, where the civil action for damages is "for the same act or omission. The evidence for the prosecution being insufficient to prove beyond reasonable doubt that the crime as charged had been committed by appellant, the general presumption, "that a person is innocent of the crime or wrong, stands in his favor. The prosecution failed to prove that all the elements of estafa are present in this case as would overcome the presumption of innocence in favor of appellant. For in fact, the prosecution's primary witness herself could not even establish clearly and precisely how appellant committed the alleged fraud. She failed to convince us that she was deceived through misrepresentations and/or insidious actions, in venturing into a remittance business. Quite the contrary, the obtaining circumstance in this case indicate the weakness of her submissions. x x x Preponderance of evidence is the weight, credit, and value of the aggregate evidence on either side and is usually considered to be synonymous with the term "greater weight of the evidence" or "greater weight of the credible evidence." Preponderance of evidence is a phrase which, in the last analysis, means probability of the truth. It is evidence which is more convincing to the court as worthy of belief than that which is offered in opposition thereto. However, in this case, no such civil liability is proved even by preponderance of evidence. The petition for the award of damages is denied. CRISTINA B. CASTILLO, Petitioner, vs. PHILLIP R. SALVADOR, Respondent.